If you don't make it to Western Europe that often, you should try to fit both France and Spain into your trip if possible. Find out your transport options below. 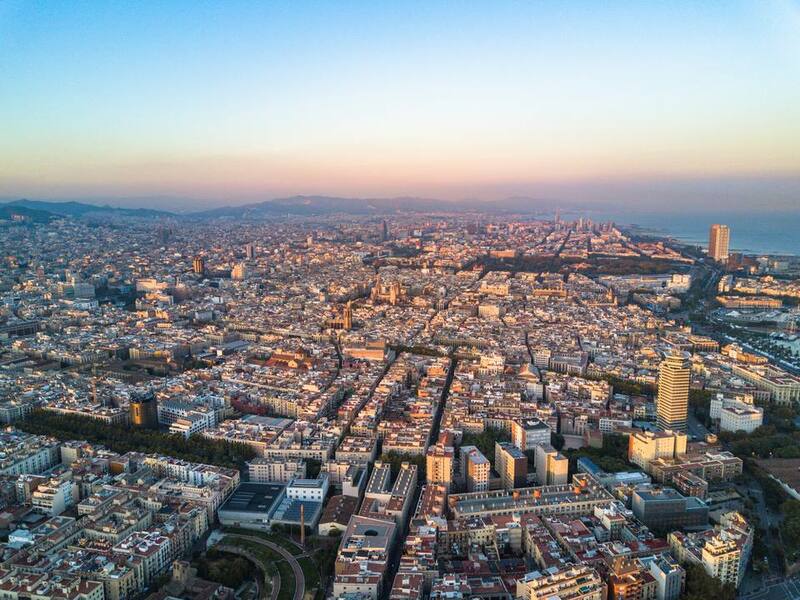 Unless you're lucky enough to be visiting two cities on the high-speed rail connection between Paris and Barcelona, you'll almost certainly want to fly. For good connections between smaller cities in Spain and France, there's the bus, but that will be slow, uncomfortable and surprisingly expensive. You can easily fly to Spain from Paris, with a number of airlines flying to Barcelona and Madrid, as well as a few that fly to Seville, Malaga, and Vigo (in Galicia). Note that there are three airports in Paris, Paris-Orly, Paris-Beauvais, and Paris-Charles de Gaulle, with flights to Spain from all of them. Most of the train routes from Spain to the rest of Europe have been discontinued, including the night train to Paris (and the services to Italy and Switzerland). In its place is the excellent Barcelona to Paris high-speed train. There were rumors once of a Madrid to Paris route, but this never materialized. It was clearly decided that the Barcelona route would make more sense. You might also want to consider buying a Spain-France Eurail train pass. The two main companies that run buses from France to Spain are Eurolines and ALSA. Unfortunately, routes are slow and expensive. The highways that connect France and Spain are well serviced and very comfortable. Hitchhiking in France is easy and a very popular way of getting around the country. It is largely safe, though you should take the obvious precautions. Girls should be wary about hitchhiking alone. Hitchhiking in Spain is much more difficult, but it isn't impossible. In most cases, you're going to want to take the high-speed train from Paris to Barcelona. There are no longer direct trains to Madrid. For visiting the north of Spain, you'll either want to take the train to Irun/Hendaye on the French-Spanish border and connect or fly. Paris to Barcelona - Take the high-speed train all the way. Paris to Bilbao - Bus to Hendaye and then the train. Or fly. Paris to Madrid - Fly or change trains in Barcelona. Paris to Pamplona - Fly via Bilbao or take the bus to Hendaye and then the train. Paris to San Sebastian - Take the train, changing in Hendaye. Or fly from Bilbao. Realistically you'll only want to head to the Basque Country in northern Spain. Bordeaux to Bilbao - Take the bus. By train, you'll need to change in San Sebastian and Irun/Hendaye. Bordeaux to San Sebastian - Take the bus. By train, change in Irun/Hendaye. Bordeaux to Barcelona - Take the bus. Biarritz to Bilbao - There is an irregular bus or a train journey that requires two changes. Biarritz to San Sebastian - Again, you will need to change in Irun/Hendaye. Take the high-speed train from southeast France to Catalonia. You don't need to go straight to Barcelona as there are sights in northern Catalonia on the train line, most famously the Dali Museum in Figueres. Lyon to Barcelona - Fly or take the train (one change). Montpellier to Barcelona - Take the high-speed train. Marseille to Barcelona - Take the high-speed train. Nice to Barcelona - Fly. Perpignan to Barcelona - Take the high-speed train. Toulouse to Barcelona - Take the high-speed train. In most cases, you're going to want to either fly or take the train from France to Spain. France and Spain are well connected by air routes, with far more connections than there are train services. The following cities are the best for getting from France to Spain. Cities earlier on the list have the cheapest flights - they can sometimes be as cheap as 20 euros! But scroll down to see which cities lie on the major train routes because you might have a more comfortable trip by rail. There are only two direct train lines into Spain - the new high-speed train service from Barcelona to Paris and the western coastline to the border. Trains to the Spanish city of Irun often stop at the French city of Hendaye instead. The stations are on either side of the international border, which you will need to walk across. Trains to Barcelona also stop in Figueres and Girona, which is great for visiting the Dali Museum. The former Talgo train service that ran down the east coast of Spain has been discontinued, as have all other services. There is no longer a train service from Madrid to France - all passengers have to change in Barcelona. In many cases, driving will be your best option. If driving in France and Spain, there are likely to be laws that are different from in your home country so research the rules of the road before your trip. How - Driving directly south from Paris, you hit the coast near Montpellier and continue along the sea until Barcelona. Also on this route - Orleans, Clermont-Ferrand, Beziers, Perpignan, Figueres, Girona. Beyond Barcelona, you'll reach Tarragona, Valencia, the Costa Blanca, Alicante, and Murcia. However, a simpler option is to take the direct train. If you're taking this train, you will probably save money by with a Spain-France rail pass. How - Head southwest from Paris, eventually reaching the west coast of France. Continue south and cross the border into Spain. Also on this route - Orleans, Tours, Bordeaux, San Sebastian, Bilbao, Burgos. Beyond Madrid (to the south) are Granada and Seville. There is also a direct Paris-Madrid train. How - As above, but heading along the north coast of Spain when you reach San Sebastian. Also on this route - Orleans, Tours, Bordeaux, San Sebastian, Bilbao, Santander, Oviedo. As with most international bus routes in Europe, Eurolines runs the buses from France to Spain. Bus travel from France to Spain isn't the quickest way around (Lyon to Barcelona, which should take six hours by car, takes 11 hours by bus! ), but the bus reaches far more destinations than the train from France to Spain. However, the journey times are so long, it's rare you're going to want to take the bus from France to Spain. If you're in the northwest of France, your best bet will be to head to Nantes or Paris and then fly or take the train. In central France, you should go to Bordeaux or Lyons. But there might be occasions where the bus is the best bet, particularly if you are happy to take an overnight bus. Sometimes the convenient of a direct service, even if it is painfully long, might be preferable to connecting somewhere. However, they will usually be very expensive. To buy bus tickets from France to Spain, you must visit the French Eurolines site, eurolines.fr. Below are the Eurolines bus routes into Spain from France. Note that these are only the principal stops - there are usually many more. In case you can see a reason to take a bus between France and Spain, here are the main routes from Eurolines.